the castle hippo. 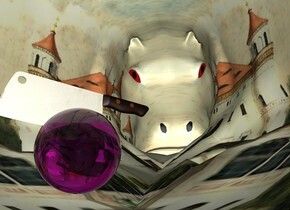 the clear purple sphere is -28 inches above the hippo. it is 3 inches tall. the shiny knife is in the sphere. the knife is 6 inches wide. the knife is facing northwest. the elephant is 12 feet left of the 20 foot tall succulent. the very huge flower plant is 2 feet in the elephant. the cyan light is ten feet in front of the plant. it is 20 feet right of the plant. the magenta light is left of the elephant. The enormous transparent cube is -5 feet above the succulent. it is one foot tall. the ground is tall and shiny. the large shiny purple lake is on the shiny very tall klee ground. the huge rhino is on the lake. the shiny purple submarine is 14 feet above the rhino. it is facing southeast. the enormous potted plant is 3 feet left of the rhino. 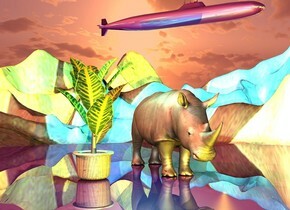 a cyan light is a foot above the rhino. it is left of the rhino. a yellow light is in front of the rhino. the sun is coral. 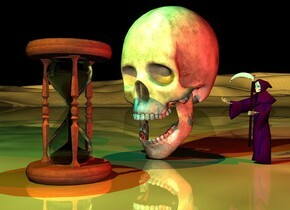 the 20 foot tall skull is on the red volcano. 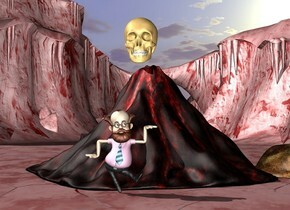 the huge professor is in front of the volcano. the cave is -10 feet right of the volcano. the ground is red. the tall grass mountain is 100 feet behind the ostrich. 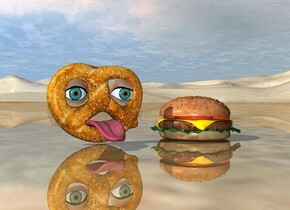 the ostrich is in the very tall shiny desert. a blue light is above the ostrich. 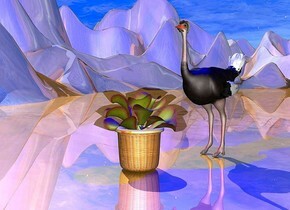 the large potted plant is in front of the ostrich. they are transparent and 3 inches apart. the elephant is 12 feet left of the 20 foot tall succulent. 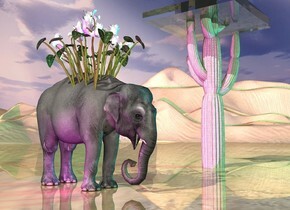 the 8 foot tall flower plant is 2 feet in the elephant. the cyan light is ten feet in front of the plant. it is 20 feet right of the plant. the magenta light is left of the elephant. it is above the elephant. The humongous transparent cube is 2 feet above the succulent. the ground is tall. the large dog is 12 inches in the snow. a blue light is 3 feet above it. a black circle is 5 inches left of the dog. it is on the ground. a small red circle is in front of the dog. it is on the ground. 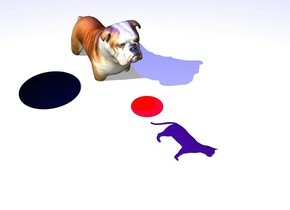 a .1 inch wide purple cat is two inches in front of the red circle. it is 14 inches tall. it is leaning 90 degrees to the left. 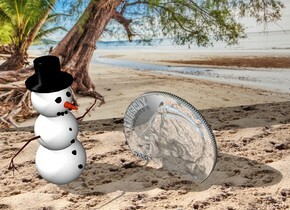 the 5 foot tall shiny money is 3 feet in front of the [beach] wall. the wall is 12 feet tall and 20 feet wide. the person is next to the money. person is facing the southeast. the person is 6 feet tall. the ground is sand. the person is on the ground. the money is 1 foot in the ground. the money is facing southwest. 9 blue lights are above the couch. 9 red lights are in front of the couch. the ground is silver. 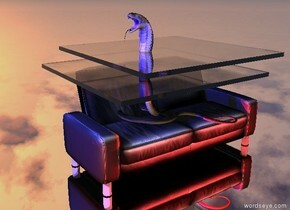 The reptile fits on the couch. it is facing left. the 4 foot deep clear plank is 5 inches above the couch. it is 4 feet wide. the second 4 foot deep clear plank is above the couch. it is 4 feet wide. the elephant is in the middle of the matisse field. 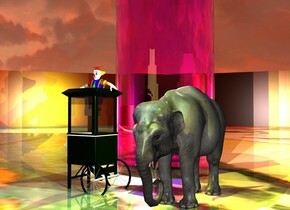 the yellow light and the green light and the blue light are in front of the elephant. 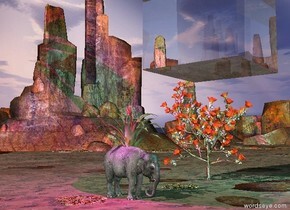 the five lights are above the elephant. the five yellow lights are above the booth. the field is shiny. the booth is three feet left of the elephant. the clown fits inside the booth. the very enormous magenta glass cylinder is 4 feet behind the booth. the sun is coral. it is partly cloudy. the brick texture is on the sphere. the brick texture is 5 inches wide. The sphere is 6 inches tall. The sphere is 8 feet wide. The sphere is 8 feet deep. 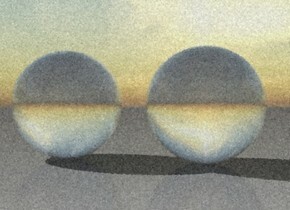 the sphere is unreflective. The tiny statue is on the sphere. The ground has a grass texture. The temple is 10 feet behind the sphere. The temple is 7 feet wide. The sphere is on the tall foam mountain range. it is morning. 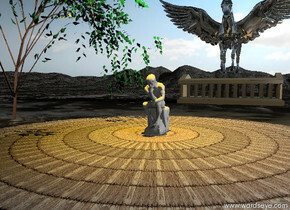 the willow tree is next to the statue. the tree is 4 feet tall. The orange illuminator is 2 feet above the statue. 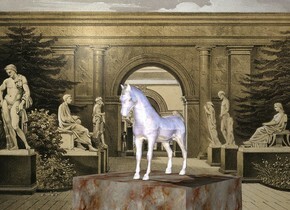 The silver pegasus is above the temple. the enormous white disk is on the grass mountain range. the large red disk is in the white disk. the white whale is on the red disk. it is facing down. 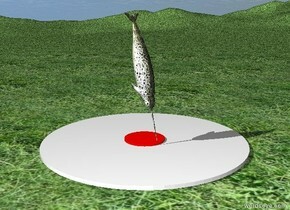 the white disk is 2 inches tall. the red disk is 2 inches tall. the large shiny purple lake is on the shiny very tall klee ground. the huge sun symbol is 4 feet in the lake. a blue light is a foot above the sun symbol. the sun is yellow. 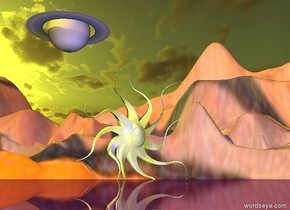 saturn is 6 feet above the sun symbol. it is 8 feet behind the sun symbol. 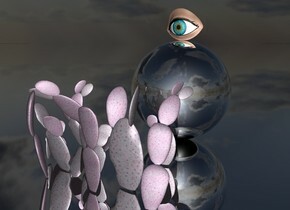 the huge eye is on the large silver sphere. the prickly pear cactus is next to the sphere. the eye is facing west. the ground is silver. 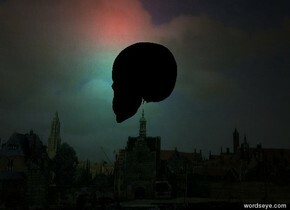 the sun is black. the matisse tornado is 15 feet above the volcano. it is 30 feet behind the volcano. 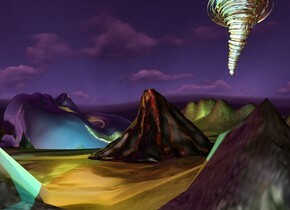 the volcano is on the very tall hell mountain range. the 200 foot tall silver head is face up. it is left of the volcano. it is 140 feet in the ground. the yellow light is above the head. the cyan light is above the volcano. the sun is purple. the [park] wall is 10 feet tall and 15 feet wide. the cobra is one foot in front of the wall. it is facing southwest. it is three feet above the ground. 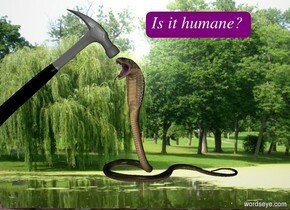 the 5 foot tall hammer is -1 feet to the left of the snake. it is leaning 50 degrees to the left. it is 4 feet above the ground. the [street] texture is on the sky. the texture is 3000 feet wide. the snake is left of the 3 foot tall pink alien. snake is facing the alien. the ground is silver. the dolphin is red. it is hazy. it is partly cloudy. the large mountain is 100 feet behind the dolphin. the dolphin is in the sea. the mountain is on the sea. the rowboat is 5 feet behind the dolphin. it is in the sea. it is facing southwest. the camera light is black. the large willow tree is in the sea. it is 25 feet behind the boat. 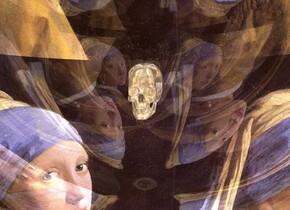 The yellow illuminator is 3 feet above the dolphin. 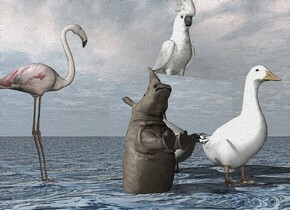 it is to the left of the dolphin. the cyan illuminator is two feet above the boat. 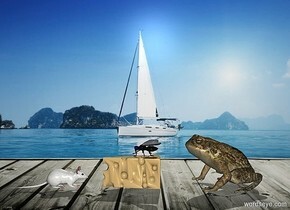 it is in front of the boat. the mountain range is 200 feet tall. it is 800 feet wide. the flower texture is on the mountain range. 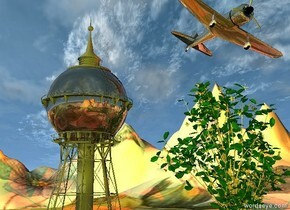 the large shiny tower is on the mountain range. The very enormous plant is 20 feet right of the tower. the very large shiny airplane is -20 feet above the tower. it is leaning left. The airplane is 10 feet to the right of the tower. the camera-light is yellow. the red light is three feet under the airplane. a blue light is above the dinosaur. the canyon is tall. an enormous chocolate cake is three feet to the left of the dinosaur. an enormous candle is in the cake. 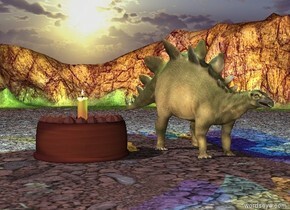 the cyan light is above the dinosaur. A yellow light is above the dinosaur. the magenta gingerbread man is next to the green gingerbread man. The green gingerbread man is next to the cyan gingerbread man. The cyan gingerbread man is next to the orange gingerbread man. 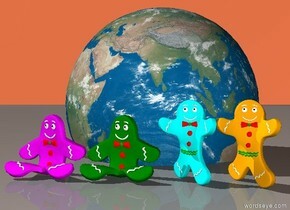 the earth is 4 inches behind the gingerbread men. it is 9 inches in the ground. the coral sky. the large duck is on the dining room table. there is a 20 foot wide barn 5 feet behind the table. the barn is dark red. the ground is shiny. there is a 10 foot wide mirror 4 feet to the right of the table. it is facing the table. it is 8 feet tall. a blue light is in front of the duck. 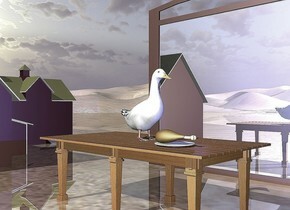 the plate is in front of the duck. the large chicken is on the plate. the rose is 5 feet in front of the cactus. the ground is tall and shiny. 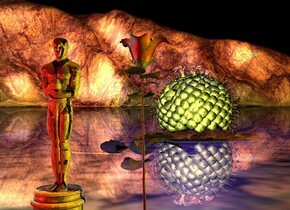 the oscar is next to the rose. it is midnight. a blue light is above the cactus. an orange light is above the oscar. the sky is coral. a yellow light is right of the rose. the camera light is black. a red light is southwest from the oscar. a cyan light is southeast from the oscar. the emoji is on the chair. 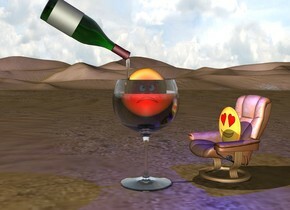 the very huge wine glass is a foot left of the chair. the second emoji is 18 inches in the glass. a red light is in front of it. a blue light is a foot above the chair. the very large wine bottle is 6 inches above the glass. it is leaning 120 degrees to the left. it is -12 inches left of the glass. the chair is facing the glass. a 20 inch tall clear cylinder is -5 inches right of the bottle. it is 2 inches wide. it is -6 inches below the bottle. the first emoticon is a foot left of the second emoticon. the second emoticon is a foot left of the third emoticon. the emoticons are in front of the 30 foot wide brick wall. they are 2 feet above the ground. the small policeman is 8 feet in front of the second emoticon. he is on the ground. he is facing the first emoticon. the emoticons are 3 feet wide. the desert. the hummingbird is above the flower. it is leaning 90 degrees to the front. 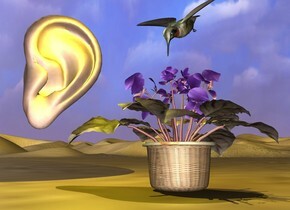 an huge ear is 5 inches left of the flower. it is facing right. it is 4 inches above the ground. a yellow light is left of the bird. the red dog is in the matisse log cabin. 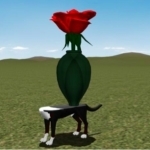 the dog is facing southeast. 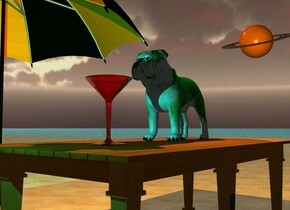 a cyan light is above the dog. a yellow light is in front of the cabin. A large fern is left of the dog. it is in front of the cabin. 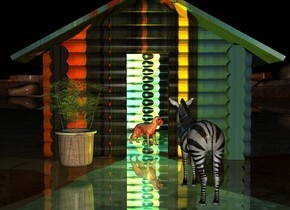 the small zebra is two feet right of the fern. it is facing the dog. it is in front of the fern. it is night. the ground is shiny. The large tiger is on the shiny malevich mat. the tiger is facing southeast. a cyan light is a foot above the tiger. it is left of the tiger. 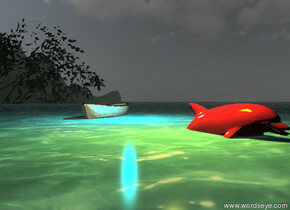 a red light is above the cyan light. 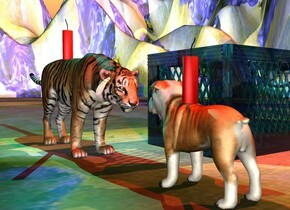 a blue light is in front of the tiger. a yellow glass wall is behind the tiger. 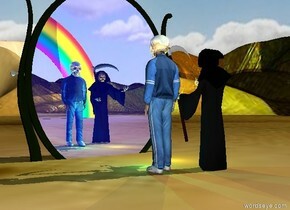 a cyan glass wall is left of the yellow wall. it is facing right. a 6 foot tall red glass flamingo is a foot right of the tiger. it is facing west. the ground is shiny. the sky is shiny. a 20 foot tall blue glass head is 20 feet behind the tiger. 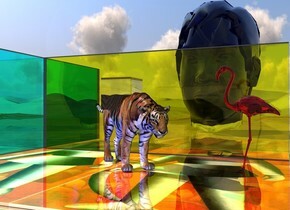 a large glass cube is a foot in the tiger.